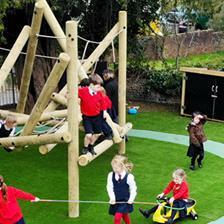 Greenfield Primary School’s Early Years playground was lacking engaging resources for imaginative play and learning. The area was rather bare and uninviting and the children had no equipment to self-select from meaning it took a long time for teachers to set up the area for outdoor play. After viewing the playground and speaking to the school, our Director and outdoor learning expert, Michael Bischof, came up with a plan to bring the area to life and create a fantastic child-led environment. 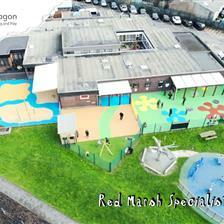 We wanted to create zones for different forms of play whilst making sure they were naturally accessible and inclusive for all of the children. One of these was Greenfield’s very own Investigative Learning Zone which encourages children to get messy and take part in investigative play together. Mud Kitchen – This will take pride of place, it has integrated 'sinks' and 'ovens' with plenty of storage shelves and holders. The top surface is 'chalk pen ready' so can be marked up with hobs etc. The service side can also be written on, perfect for early mark making. Sand/Mud Quarry – The main source for materials that children can collect together. Outdoor Free Standing Scales – Hovering over the Quarry, children can weigh their materials to supply exact amounts through balancing the scales. Rope and Pulley Materials Mover – ‘The Overhead Crane’, this can be used to transport materials from the quarry to the Mud Kitchen and Damming Table… great collaborative fun! We situated the Tower on its very own 'island' which was created with earth/sand tone coloured Wetpour surfacing. The island is also surrounded by a blue river (created with Wetpour surfacing) to help zone the area creatively as well as make children feel like they are playing on a deserted island surrounded by water. In the active zone, children will improve their balance, grip, grasp and upper body strength. Greenfield’s young music enthusiasts now have a Musical Stage to perform on to help develop their self-esteem and fascination with music. The stage is single decked, compete with a chalkboard backdrop and two pieces of musical play equipment on either side. Being on a stage outdoors will give the children a sense of freedom which will lead to improved posture, better voice projection and greater creativity. Teachers will now be able to use the stage to introduce actives such as debating sessions on simple topic as well as fun events such as the children’s own pop concert. For additional open-ended and role play opportunities, we installed our Giant Playhouse with Chalkboard. Children can now choose whether to have their very own Bakery, Post Office or Travel Agents… the possibilities are endless. 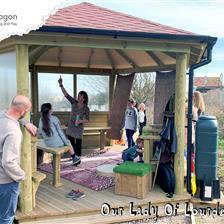 To give children and teachers a classroom in the fresh outdoors, we installed our Gazebo with a bespoke specification. We ensured that the Gazebo had openings on opposite ends to keep the free-flow feel that this great area conveys. The children can run or walk through the Gazebo to get different zones of play with ease. We're experts in creating thriving outdoor learning environments for Early Years children, if you're looking to develop your outdoor area, simply Contact Us through the website to discuss in further detail.